As the cold weather dies down and the sun begins to slowly return, it feels as if there is a certain something in the atmosphere – spring is on its way. Months of snuggling up by the fire are finally coming to an end and for some, this signifies one thing only: the dreaded spring clean! But why not make this year’s clean different from the rest and have a complete overhaul of your beloved sleeping space? As we say goodbye to winter for another year, there is a strong likelihood that we have gained a few gifts over the season; whether these were acquired through birthday celebrations, Christmas festivities or any other events that you may have enjoyed over the course of the cold winter months, a sizable portion of these gifts will end up sat in the bedroom more often than not. These are the gifts that you didn’t necessarily want or need, but nonetheless they are in your house and impeding your interior design plans for the new year with their clutter. A thorough spring clean can solve this; try to avoid keeping clutter in your house that could be better appreciated by a charity shop. Once you have undertaken your thorough spring clean, you can start thinking seriously about a fresh update to your room. Changing up your aesthetic has been shown to have positive effects on the mind; it might even alleviate stress or reduce the risk of depression and anxiety when you sleep in a fresh and beautiful room. As your bedroom is the place where you sleep, it should also be your sanctuary; a place to look forward to spending time in. By making the room more in line with seasonal trends, you are subconsciously making your bedroom a more inviting space. There are several ways to achieve a spring update in your sleeping space, but to significantly change your room without the expense of introducing a range of new furniture, repainting is definitely the way to go. Rejuvenate your tired walls from the damp winter with a new splash of colour. Bedrooms in 2019 will feature light sandy tones and natural colours to both uplift and calm their inhabitants; pastel colours are especially useful for reflecting light around a room. Similar to the use of these wonderful colours, using white or lighter coloured furnishings can add a tone of freshness to a room. 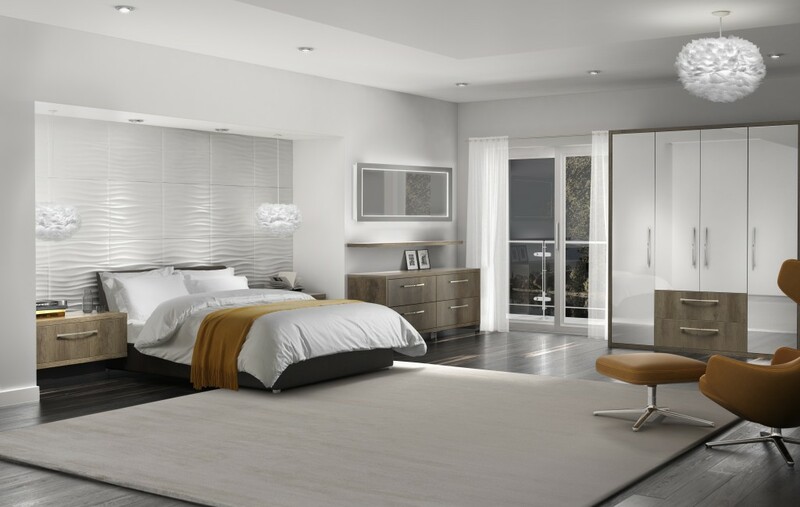 Connoting innocence and cleanliness, white gives your bedroom a fresh new look. If this theme feels a little too bland for you, then consider adding a few bolder accents around the room in richer shades. Remember to always keep what makes you happy. That winter feeling isn’t confined to the colours used around your bedroom; you also need to think seriously about the items you keep on display. Heavy blankets, plush dressing gowns and thick coats are symptoms of a house plagued by a wintry aesthetic. You can amend this quite easily by switching out any heavy fabric items on display for subtler, lighter ones. Heavy duvets should be switched for lighter ones, so put the heavy blankets and counterpanes in the wardrobe and instead drape some linens on the bed to give your room some light fluttery spring feelings. You will certainly be glad of the cooler atmosphere you have created in the hot Summer months. You should also make use of the increased daylight hours by adding more mirrors to spread the light entering your room further. This will give the impression that your room is much larger and brighter than it actually is, which is something every home owner aspires to achieve. At Panararmer, we can help you achieve all of the above, from the designing stage right through to the fitting process. We do both bedrooms and kitchens from Kendal where our showrooms are based and we offer service across Cumbria, Lancashire and West Yorkshire. We are happy to provide you with lots of helpful advice throughout your journey, so contact us to arrange an appointment with one of our designers today.